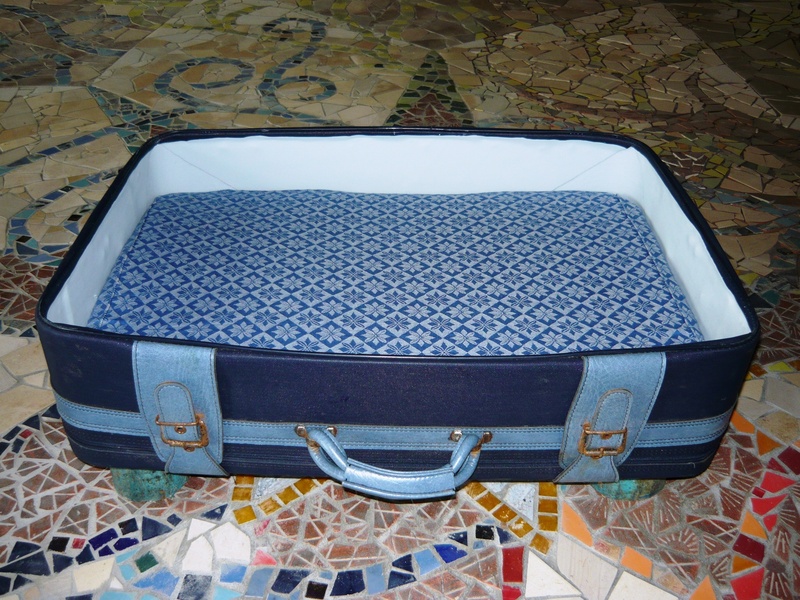 Recycled pet bed from an old suitcase. 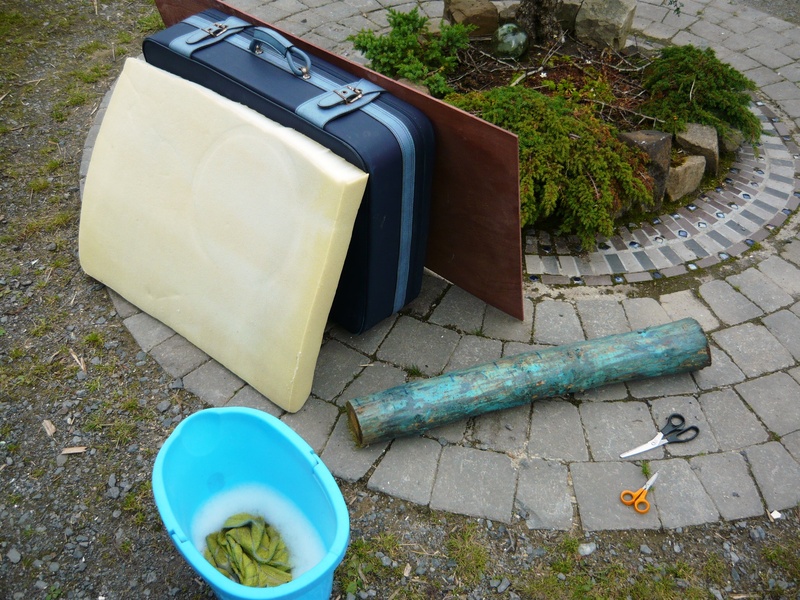 If you are a regular reader of this blog you know that we like to recycle and reuse as many items as possible. When our newly adopted puppy needed a bed we wanted to make it ourselves. 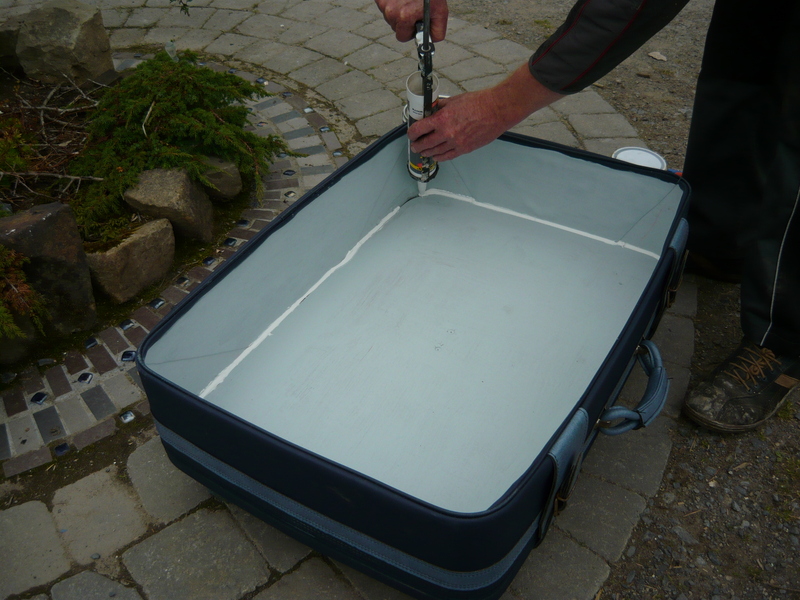 We had an old suitcase in the shed that came with the house when we bought it and up until now had been used to store tiles in for mosaics. 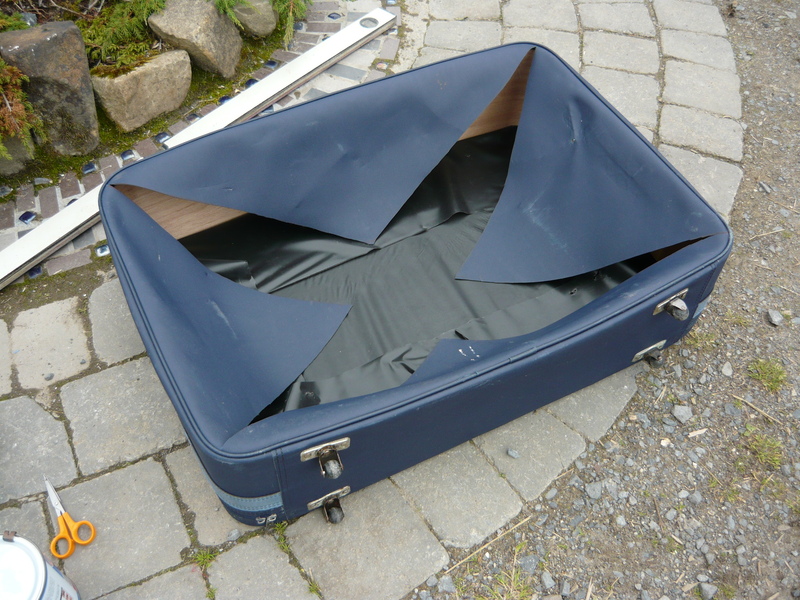 We started the transformation from suitcase to bed by washing it thoroughly and zipping and buckling it up. Then we turned it over and cut a cross from the four corners and glued the flaps down securely. 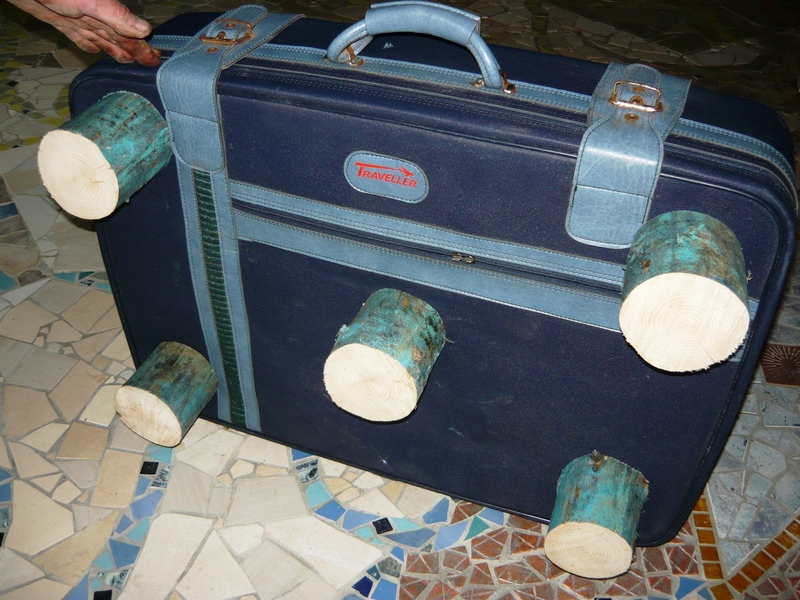 We cut a piece of plywood to fit inside the suitcase and glued it down. After that it was time to attach the legs. We made them from a piece of round wood cut into 10 cm sections. 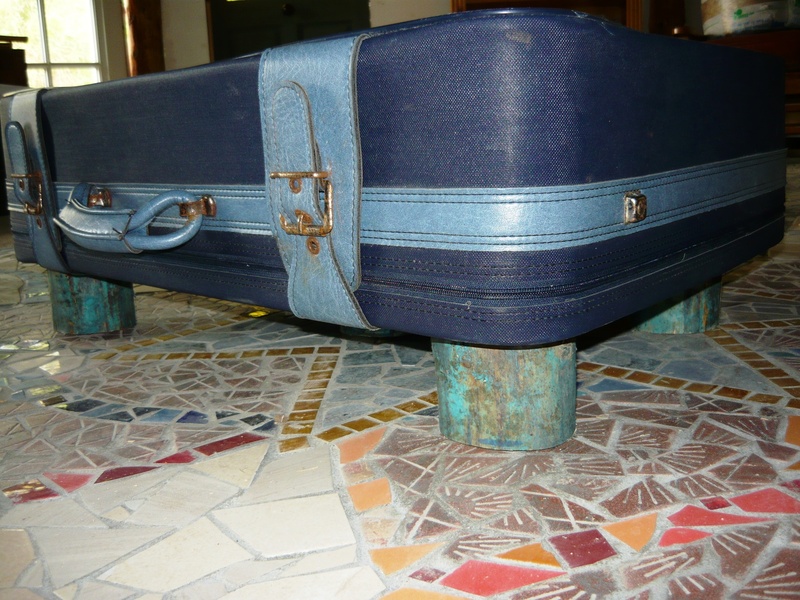 The legs were attached to the underside by screws from the inside of the suitcase, through the plywood and suitcase material. 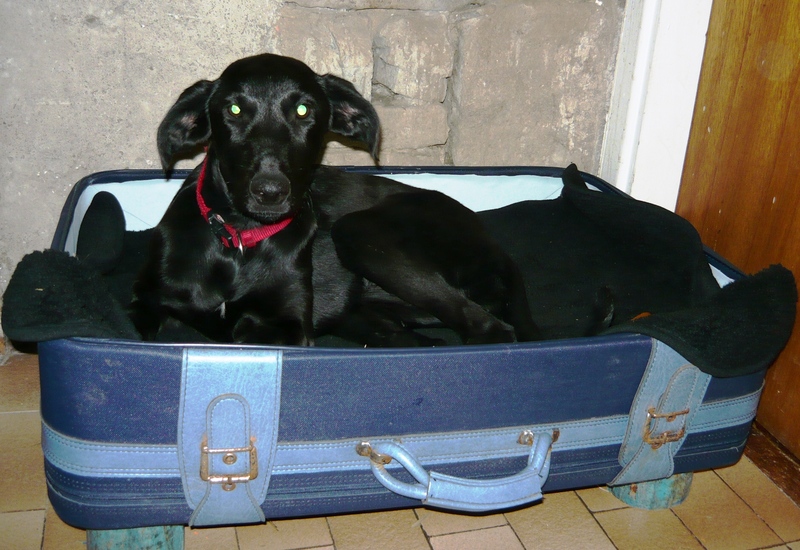 Now the bed has five very sturdy and heavy legs that make it stay in place when our dog climbs in and out. 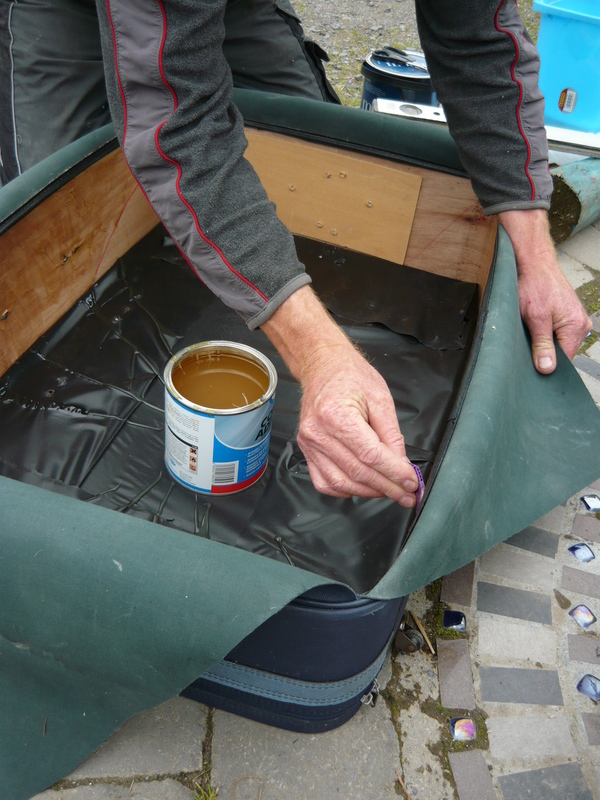 We gave the inside of the bed two coats of washable matt emulsion, adding filler around the plywood bottom after the first layer and ended up with a practical, easy to clean bed. 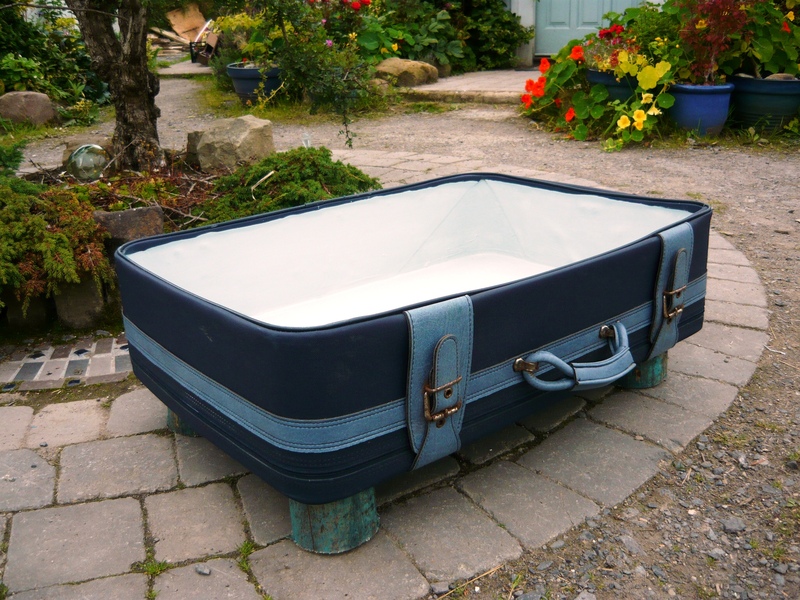 We used an old foam mattress, cut it into shape and made a washable, detachable cover for it. After that all the bed needed was a fluffy dog blanket and it was ready for Dubh. 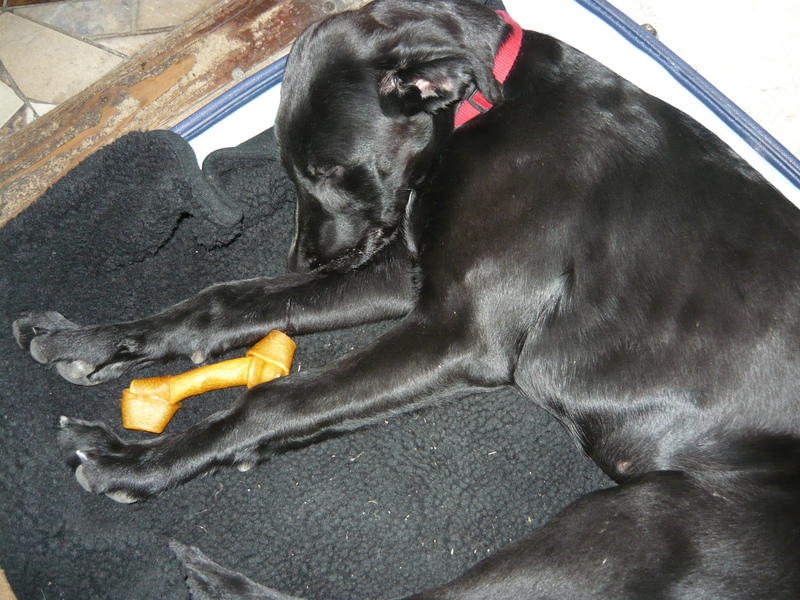 We adopted her today and although she has only been in the house for about 9 hours she already loves her bed and has dozed off in it a couple of times in between all the excitement of a new home, a garden to explore and new country lanes to go for walks down. We are hoping she will sleep soundly in it tonight. 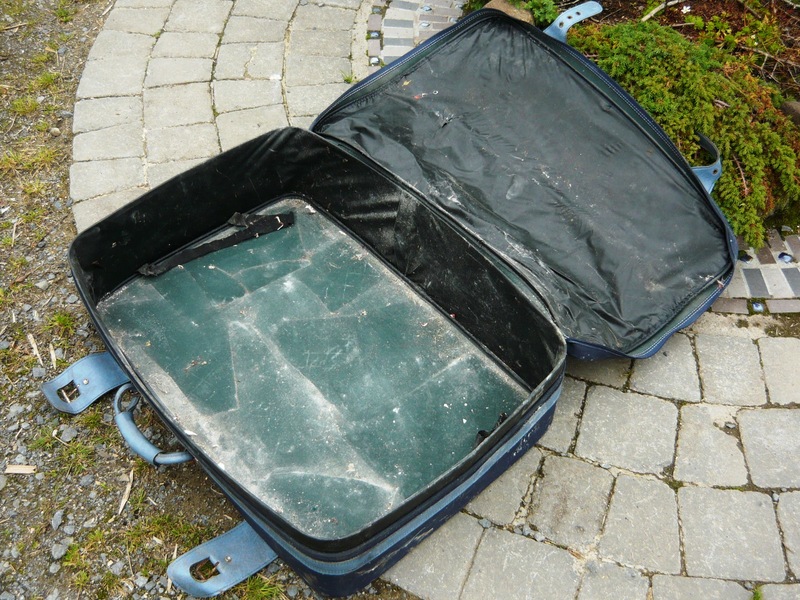 As she is only about five months old we expect her to grow quite a lot bigger and maybe we need to look for a larger old suitcase in the months to come. 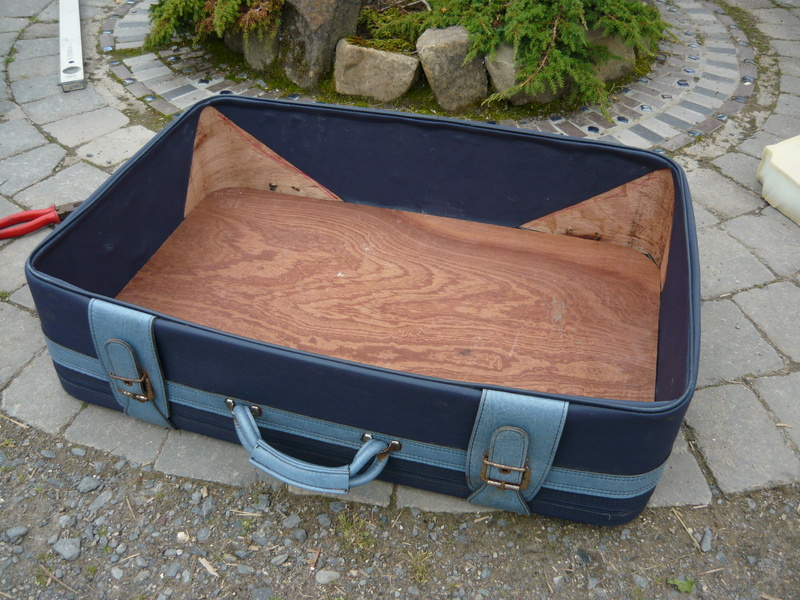 You will be preventing the old suitcase from going into landfill and by not buying a new pet bed you are doing the Earth a favour in the process. It is a quirky addition to your home and you can adapt it using colours and fabrics to suit your own taste and style. Have fun if you decide to try this out for your dog or cat. ← Every dog has its day.